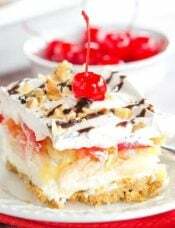 When I was a kid, there were two types of Jello desserts – there was Jello in a big bowl that was usually prepared by my grandma or great aunt (and it was always a toss up as to whether there would be some type of cut-up fruit floating around in there), and then there was finger Jello, or Jello Jigglers, or Knox blocks… I’ve heard them called all of those names. 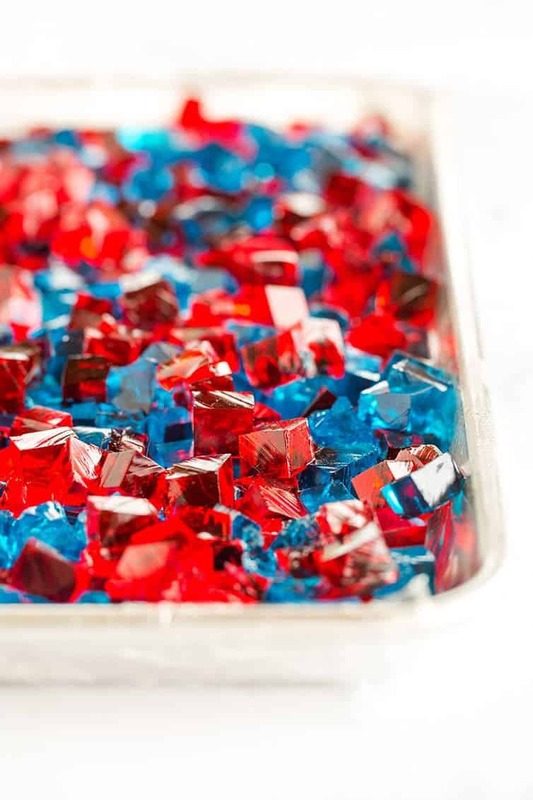 Basically, it was Jello prepared with less water so it set up denser, then cut into blocks and could be picked up and eaten with your fingers. I LIVED for finger Jello – it was a summer staple! So when I first learned that I could do the same thing while combining different colors for a super cool effect, I was all-in. Watch How to Make Stained Glass Jello Stars! I was so entranced when I first saw a picture of stained glass Jello on The Food Librarian. She had done hers up in purple and yellow to cheer on the Lakers (this was yearssssss ago), and it looked awesome. At the time, I had the idea to make a black and gold variety (for Pittsburgh sports, naturally), however, I’ve never seen black Jello, have you? I thought perhaps they would sell blackberry, but I couldn’t find any. So, I went back to making more batches of the decorated sugar cookies and put the stained glass Jello on the back burner. 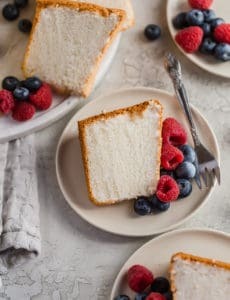 Only a few weeks later, I realized that using strawberry and berry blue flavors could make a pretty cool red, white & blue dessert for the 4th of July. 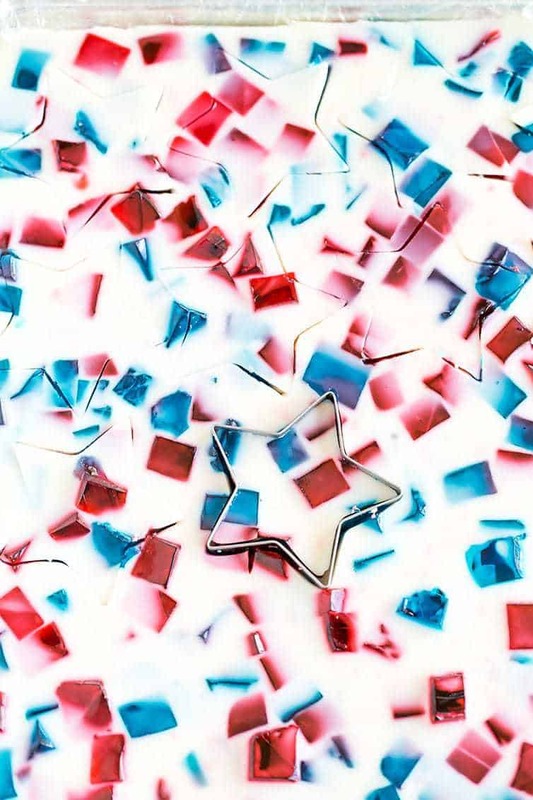 And to be even more festive, I used a cookie cutter to cut the Jello into the shape of stars. These are always so fun to make and I think it’s a great presentation for a holiday picnic. You could switch up colors to reflect school graduation, various sports teams, company logos – anything at all! And if you have some fun cookie cutters in your stash, the possibilities are truly endless. Or simply cut them into squares and dig in! 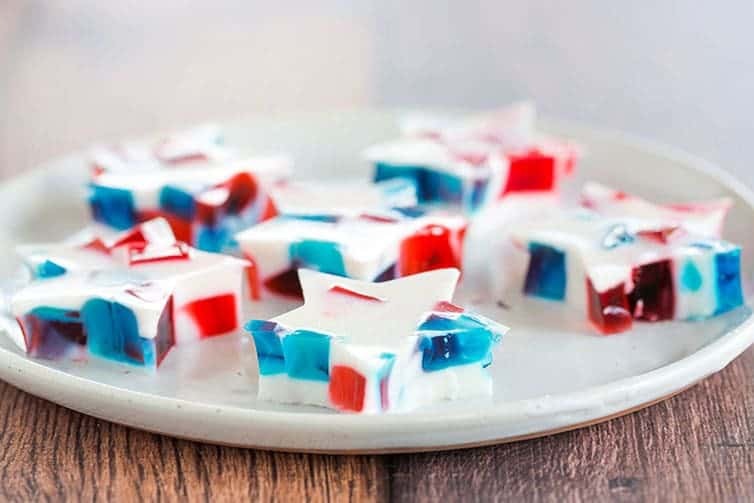 These red, white & blue stained glass Jello stars are a fun and easy addition to your 4th of July celebration! Line four loaf pans or other small pans with plastic wrap. In four separate bowls, dissolve one box of Jello in 1 cup of boiling water. Stir for 2 full minutes, until it is completely dissolved, then allow to cool to room temperature. 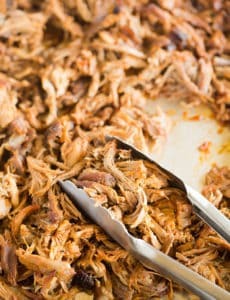 Pour each into the prepared pans and chill at least 3 hours, or overnight. 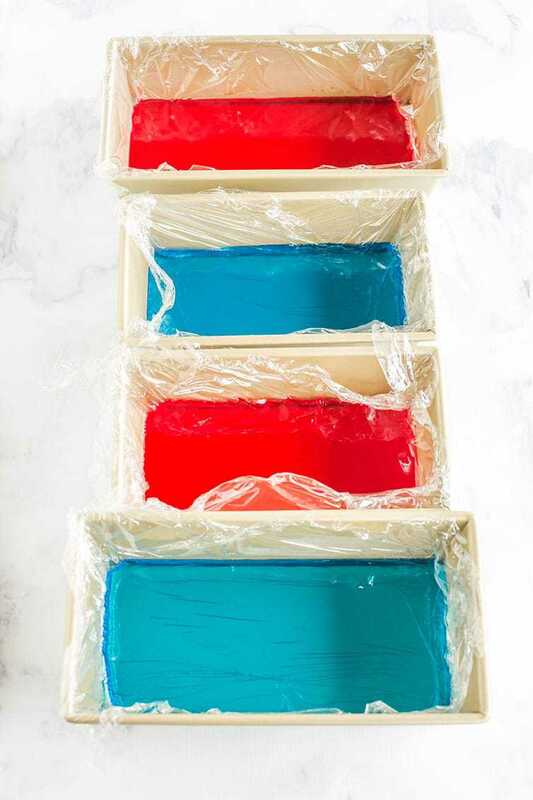 Turn the chilled Jello out onto a cutting board and slice into ½-inch blocks. Add the blocks to a jelly roll pan or 9x13-inch pan that has been lined with plastic wrap. Gently spread the blocks so they are in an even layer and the colors are evenly mixed. In a separate large bowl, sprinkle 2 envelopes of unflavored gelatin into ½ cup cold water and allow to sit for 5 minutes. After the gelatin blooms (it will look mostly dissolved and get wrinkly on the surface), add 1½ cups boiling water and stir to dissolve. Add the can of condensed milk and stir to combine; set aside to cool to room temperature. 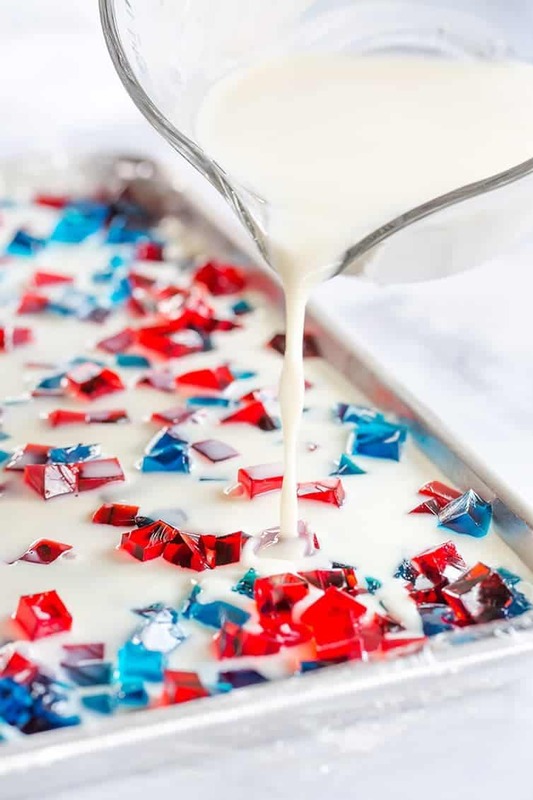 Pour the cooled milk mixture over the red and blue Jello blocks in the pan. Chill overnight, or at least 3 hours until firm. Cut into blocks or shapes and serve. 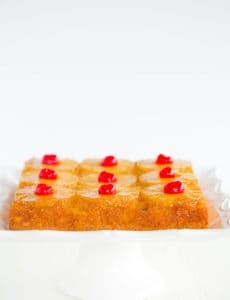 I lined my pans with plastic wrap so that I could easily lift the Jello out of the pan and turn it onto a cutting board to slice; you could spray your pans with non-stick cooking spray if you'd prefer. Use any size pan you would like for the red and blue colors, but I've found the smaller, the better. If your pan is too big (I've done 8-inch squares in the past), the blocks come out looking pretty flat. I have found that using a jelly roll pan is the perfect thickness if you're planning to cut shapes. If you are simply cutting into blocks, a 9x13-inch pan will give you thicker blocks and would work just fine. 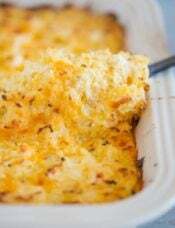 This recipe was originally published on July 2, 2009. Can vodka be added to this recipe? I love the plastic wrap idea! Wish I’d read this post before making my jello. In regards to making black jello, what about combining equal amounts of different jello flavors together, or maybe use more green, purple and blue jello? That might make black or blackish jello. In the world of color, if you mix a variety of colors together, like purple, green, blue, red, etc. the resulting color is black. Not sure if that would work with jello, but just a thought. Thanks again for the plastic wrap idea!!! Made these for our 4th of July celebration and they were a big hit! I used four disposable loaf pans to make the red and blue jello and it worked out well. I used a jelly roll pan since I was cutting them into stars, but I think I will go 9×13 next time. The stars were a bit thin and floppy, which made them messy/hard to eat as finger food. Nevertheless, everyone enjoyed them. 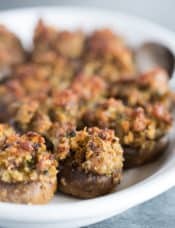 Thanks for the recipe inspiration! This was a hit!!! Great recipe. These turned out great! What a fun project! Not sure if anyone posted, but black jell-o can be made with a 3 to 1 ratio of grape or black cherry to orange jell-o powders. You can add food coloring too, but I never need to. How ’bout those back to back Stanley Cup Champion Pittsburgh Penguins?!?!?! Thanks for the awesome tip, Diane! And seriously, what a ride! Beautiful! Great idea for a Canada Day celebration with my maple leaf cookie cutters! Thank you!! 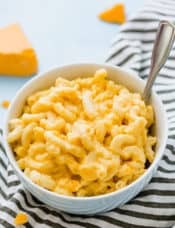 The recipe is look very easy, I definitely try it. These looks yummy and beautiful. Everyone should try these on 4th of july. Thank you for sharing. I am going to make these for 4th of July this year. They look so fun! I am going to buy 2 strawberry and 2 blueberry, I understand you need 4 boxes. What I have a question about is whether I can cook and combine the 2 reds together or do you need to cook and keep all 4 jello seperate the whole time? Also how about combining the same colors when you put them in square containers, or should they keep seperate? Thanks! 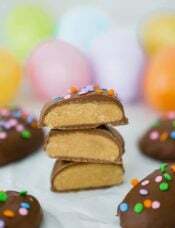 I can’t wait to make these, I just want to screw them up! Hi Kristen, Yes, you can combine the reds and the blues together, and put the same color in one container. Enjoy! 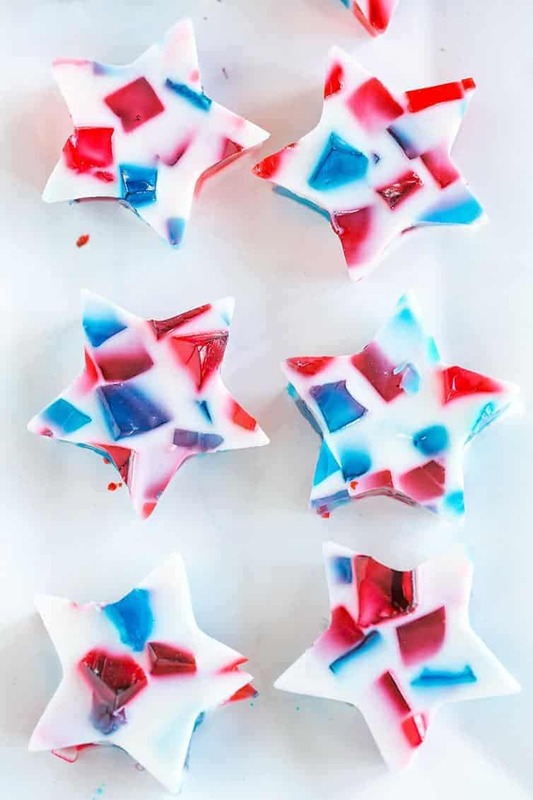 I wanted to let you know I am featuring your Stained Glass Jello Stars for the 4th of July in my Easy 4th of July Recipes post on 6/20/14! 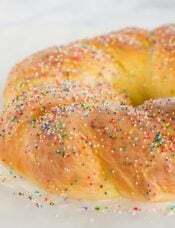 I thank you for sharing your recipe and am exited to include it alongside other great 4th of July recipe ideas! Never thought of using sweetened condensed milk for jello. I think I’ve only made Jello shots once in my life, but I guess follow that formula but use the sweetened condensed milk and unflavored gelatin instead? My daughter was born on the 4th of July 2012 and we’ll be celebrating her 1st birthday on June 29th. I’ll be making these for her party. Thank you for the great idea!